C.J. Rea's passion for Alaska and its breathtaking marine ecosystem is evident throughout her work both as an author and as a dedicated naturalist in the Kenai Fjords National Park. C.J. was introduced to Alaska when, after completing her Master's degree in marine biology at Western Washington University, she accepted a research position in Prince William Sound examining the recovery of algal species exposed to oil by the Exxon Valdez spill. Since that experience Alaska has become part of her life. She returned the following spring as an observer for National Marine Fisheries aboard 80 to 120 foot fishing vessels working out of Kodiak Island. Over the course of four years she worked on 23 different vessels in 5 different fisheries in winter, spring and summer. She experienced breaching whales, nets jammed so full of fish they could be walked upon, and sea lions bold enough to climb aboard a fishing vessel to steal a meal. She learned first hand what 25 foot seas mean to an 84 foot boat; what it means to be "iced up" in Shelikoff Straits 12 hours from home port; and the very real relief one feels arriving to port with a four degree list from ice on the boat but all hands accounted for. In 1995 C. J. brought her experience of the Alaskan waters to a new job as a National Park Ranger. For several years she has introduced visitors to Alaska to the ecosystems and creatures of Kenai Fjords National Park aboard all day boat trips into the fjords to view glaciers, whales, seals, sea lions and a myriad of sea birds. The people she meets are motivated to know more about the creatures they are seeing, often for the first time. They want to take the experience home to share with friends and family, children and grandchildren. Inspired by her experiences, C.J. worked with her sister Ba Rea, to create There Have Always Been Puffins and A Whale's Tale from the Supper Sea combining fact and storytelling especially for this unique audience. 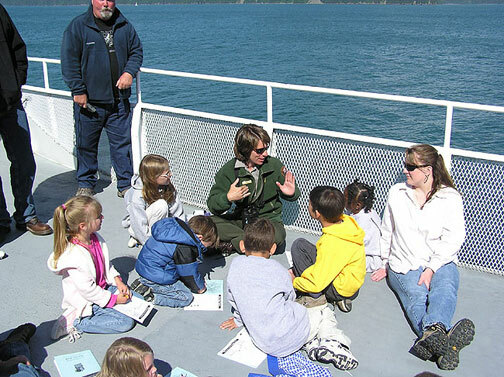 Today C. J. is an Education Specialist at the Kenai Fjords National Park. You can find her web based storyKenai the Kid — introducing the ecosystem of the Kenai Fjords through the eyes of a young mountain goat — on the park website.